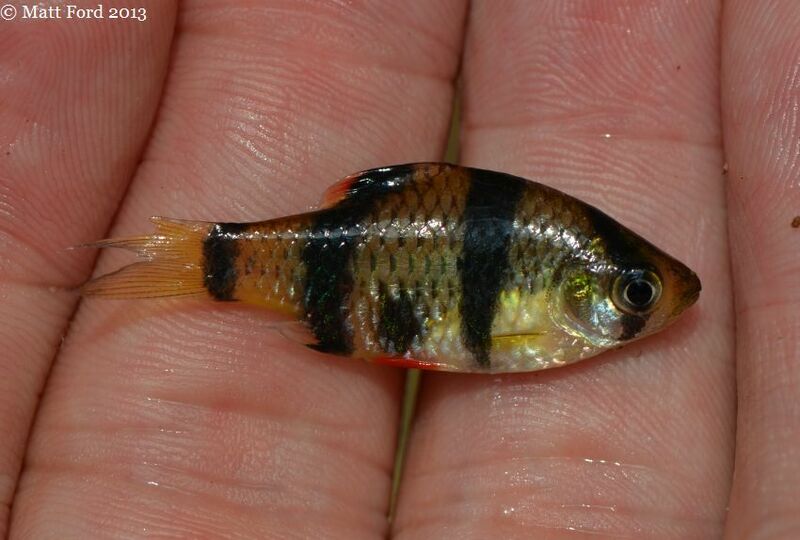 Specimen from the upper Sungai (river) Sarawak, Malaysian Borneo. 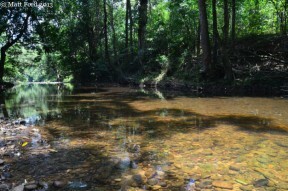 Habitat in the upper Sungai Sarawak basin. Specimen from the U.K. aquarium trade, collected at an unspecified locality in Kalimantan. This species appears to prefer sandy to rocky substrates. Detail of head and anterior portion of body, with maxillary barbels visible. 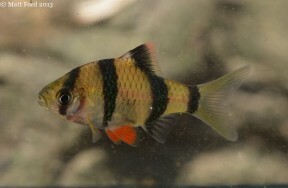 Individual with aberrant markings from the upper Sungai Sarawak. Specimen from the Sungai Sarawak. 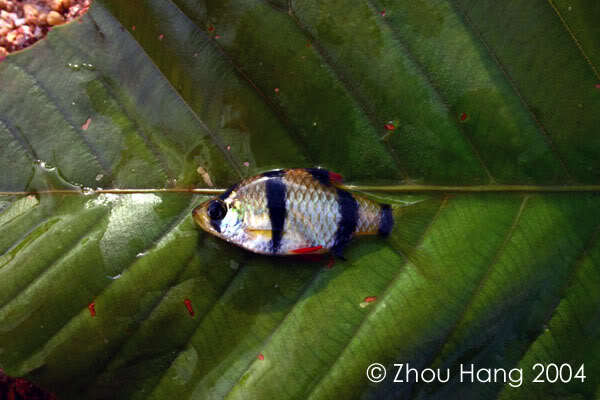 One of the distinguishing characters of this species is solid red pelvic fins, as seen in this individual from Sarawak. anchisporus: Vaillant did not specify the precise derivation, but probably from the Ancient Greek ἄγχῐ (akchi), meaning ‘near’, and σπόρος ‎(spóros), meaning ‘offspring’, in reference to this species’ resemblance to certain other small cyprinids. Endemic to Borneo, with Indonesian records from the Kapuas and Mempawah rivers in Kalimantan Barat (West Kalimantan) province, Maruwei, Pembuang, Teweh, and Kahayan watersheds in Kalimantan Tengah (Central Kalimantan), plus the Negara and Jorong drainages in Kalimantan Selatan (South Kalimantan). 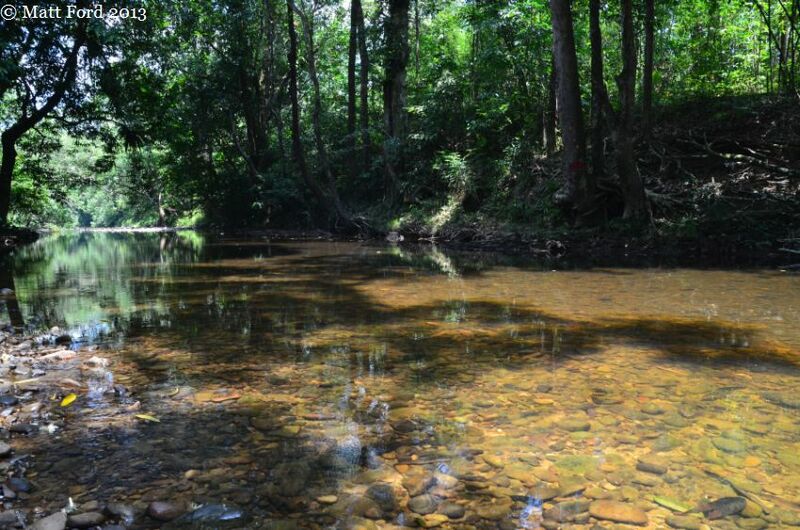 It also occurs throughout much of Sarawak state in the Malaysian part of the island, although official records are lacking (M. Lo, pers. comm. ; pers. obv.). 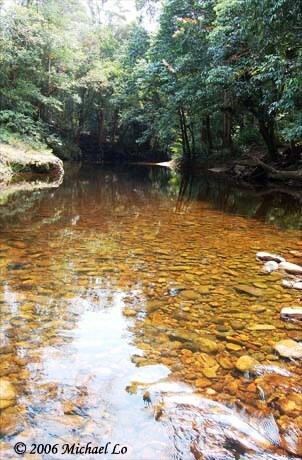 Type locality is ‘Kapuas River, Borneo, Indonesia’. 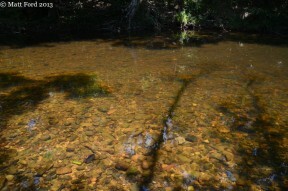 Occurs in forest streams and tributaries containing relatively clear water and sandy to rocky substrates. Marginal vegetation tends to grow thickly and the water may be stained yellowish with tannins and other organic substances. 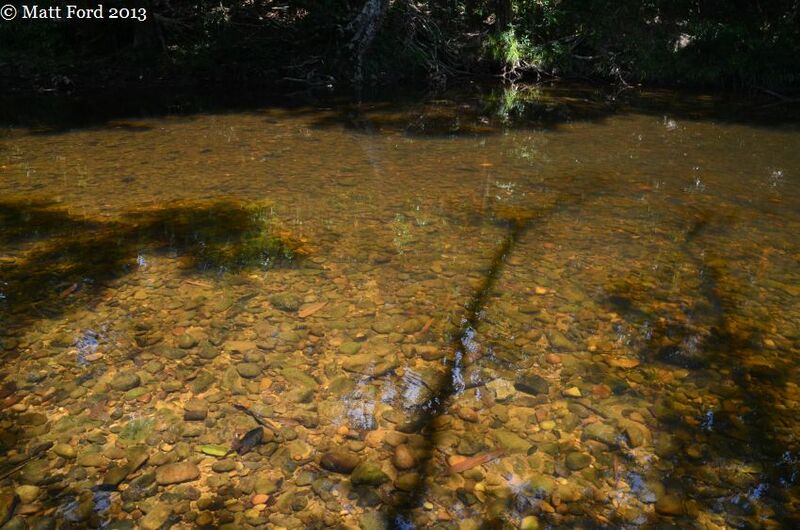 Beds of aquatic plants from genera such as Cryptocoryne or Barcalaya and patches of submerged leaf litter can be found in some habitats. Sympatric species include members of Desmopuntius, Eirmotus, Rasbora, Gastromyzon, Nemacheilus, Pangio, and Paracrossocheilus. An aquarium measuring at least 80 ∗ 30 ∗ 30 cm is required. Probably an omnivore feeding primarily on insect larvae and zooplankton, but also known to browse plant material and organic detritus (pers. obv.). 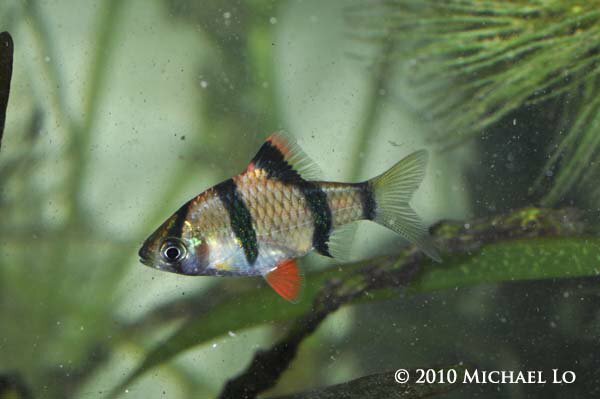 It is distinguished from congeners by the following combination of characters: lateral line complete; 14 circumpeduncular scales; 21-23+2 scales in the lateral row; dorsal-fin black with red outer band; pelvic fins red. Résultats zoologiques de l'expédition scientifique Néerlandaise au Bornéo central. 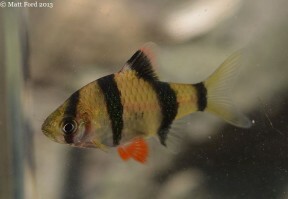 I was lucky enough to get a group of 20 wild Anchisporus and as yet haven’t noticed any aggressive behaviour either towards each other or indeed other fishes ,although I must say I do keep them with other species of Barbs so I guess they may not be able to really stamp their authority as they indeed might with slower moving fishes ? 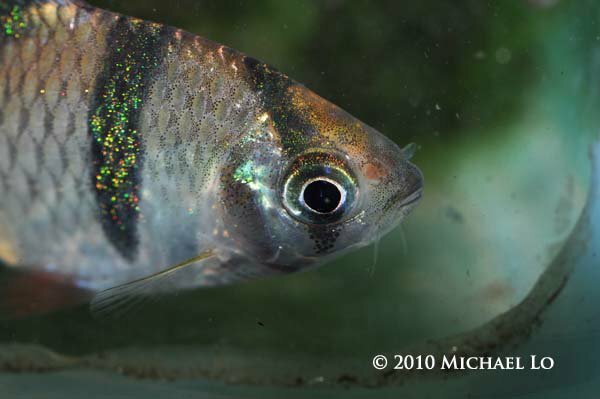 Also when I first bought them they were quite small and really very shy even though kept as a fair sized group , I have now moved them into larger quarters and they have really blossomed into Beautiful fish ,somtimes shoaling other times forming loose little groups !